This promotion is in no way sponsored, endorsed or administered by, or associated with, Facebook, Twitter, Instagram or any other social network or platform. You understand that you are providing your information to Ticketspin and not to Facebook, Twitter, Instagram or any other social network or platform. Eligibility: The VIP UPGRADE AND TICKET CONTEST BY TAKING BACK SUNDAY / TICKETSPIN ("Promotion") is open only to natural persons who are legal residents of the United States of America who have a valid social security or tax ID number, who are at least eighteen (18) years of age or the age of majority where residing (whichever is greater), and who are not involved in any way in the business of concert promotion. Promotion may only be entered from and in eligible jurisdictions.  Taking Back Sunday/Ticketspin and its parent, subsidiary and affiliate companies, employees, agents, and suppliers, as well as the immediate family (spouse, parents, siblings, and children) and household members of each such employee are not eligible to participate. In the event of a dispute as to the identity of an entrant, the authorized account holder of the account will be deemed to be the entrant. All potential winners are subject to verification before any prize will be awarded. Subject to all applicable, federal, state, and local laws and regulations. Void where prohibited. Participation constitutes entrant's full and unconditional agreement to these Official Rules and Taking Back Sunday's decisions, which are final and binding in all matters related to the Promotion. Winning a prize is contingent upon fulfilling all requirements set forth herein. Timing: The Promotion period begins at 10:00 AM Pacific Time on June 6, 2018 and ends at 11:59 PM Pacific Time on June 12, 2018. Prizes: Three (3) prizes will be awarded at random, one chosen from each social media platform. 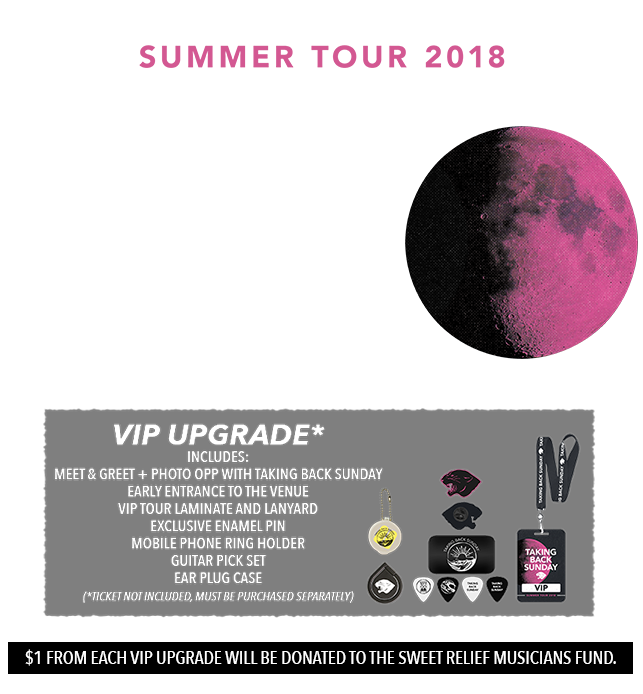 Each prize will be one pair (2) of tickets to the show of their choosing that takes place during the summer tour (July 6 — August 12) along with one pair (2) VIP Upgrades to that same show. If the winner is unable to make it to this tour, there could be a pair of tickets given instead to a future date at Artist's discretion, but there is no guarantee, nor is there a guarantee that a VIP event will coincide with those tickets. The Prize has no cash value other than as described above, which is valid at time of Prize acceptance only. Tickets and Upgrade Prize selection cannot be exchanged for cash. All other expenses not specifically mentioned herein, including, without limitation, transportation, accommodations, and event parking are solely the winner's responsibility. Approximate Retail Value ("ARV") of these prizes varies per show but is approximately $250 each. Selection and Verification of Potential Winners: A representative for the Artist will randomly select three (3) winners from all eligible entries on or around June 13, 2018. If a potential winner of any prize cannot be contacted, declines the prize or prize is returned as undeliverable, such potential winner forfeits the prize. In the event that a potential winner is disqualified for any reason, Artist will award the corresponding prize to an alternate winner by random selection among all remaining eligible entries. All alternate potential winners are subject to all requirements set forth in these Official Rules. Only three (3) alternate winners will be selected, after which the prizes will remain un-awarded. Publicity: Except where prohibited, participation in the Promotion constitutes winner's consent to Artists use of winner's name, social media identity, likeness, photograph, voice, opinions, hometown and state for promotional purposes in connection with this Promotion in any media, worldwide, without further payment or consideration. Artist also retains the right to use the flyer posted with the entry in any means. Privacy: Information submitted by entrants will be collected by Artist and assumed to be used in connection with guest listing for prizing. No hard tickets will be sent. Inaccurate information, whether caused by entrants, printing errors or by any of the equipment or programming associated with or utilized in the Promotion; (2) for technical and/or communications malfunctions, errors or failures of any kind; (3) for unauthorized human intervention in any part of the Promotion; (4) for technical or human error which may occur in the administration of the Promotion or the processing of entries; (5) for any injury or damage to persons or property which may be caused, directly or indirectly, in whole or in part, from entrant's participation in the Promotion or receipt or use or misuse of any prize; or (6) if the Promotion cannot take place or if any prize cannot be awarded due to acts of war, natural disasters, weather, acts of terrorism, or in the event that Artist becomes insolvent, files a petition in bankruptcy or otherwise ceases to do business in whole or in part including any possible reason for cancellation of the tour, Artist will have the option to award a pair of tickets to a future show but is under no obligation to do so. Release: By participating in the Promotion, entrant (a) releases Taking Back Sunday and it's touring corporation Touring Is Most Funnest, Inc. along with any of their affiliated companies, their vendors, any promotional agencies, franchisees, and each of their respective companies, affiliates, subsidiaries, successors, assigns, agents, representatives, officers, directors, shareholders, family members and current or past employees, from any and all liability for any claims, costs, injuries, losses or damages of any kind arising in connection with the Promotion, including the unauthorized or illegal access to personally identifiable or sensitive information or acceptance, possession, use, misuse, or nonuse of the prize that may be awarded; and (b) acknowledges that the foregoing parties have neither made nor are in any manner responsible or liable for any warranty, representation or guarantee, expressed or implied, in fact or in law, relative to a prize including, without limitation, the prize quality or availability. Disputes: As a condition of participating in the Promotion, entrant agrees that: a) under no circumstances will entrant be permitted to obtain awards for, and entrant hereby waives all rights to claim, punitive, incidental, consequential, or any other damages b) all causes of action arising out of or connected with this Promotion or the prizes awarded, shall be resolved individually, without resort to any form of class action or lawsuit. Artist reserves the right to modify prize award procedures. The Promotion and these Official Rules, and the validity, construction, performance, and enforcement thereof, shall be governed by and construed in accordance with the laws of State of California, without giving effect to any choice of law or conflict of law rules (whether of the State of California or any other jurisdiction), which would cause the application of the laws of any jurisdiction other than the State of California. Winner's List: To obtain a list of the names of winners of prizes with a value greater than $25, mail your request and a self-addressed, stamped envelope, up to sixty (60) days after the close of the Promotion, to Touring Is Most Funnest, 15260 Ventura Blvd., Suite 2100, Sherman Oaks, CA 91403 Attn: Summer Tour VIP Upgrade and Ticket Contest Winners. Please allow sixty (60) days for a response.